Heart disease, the carbon footprint of city-dwellers’ food and recovery from sickness in the sixteenth century were among the research topics that won prizes for Reading early career researchers last night. 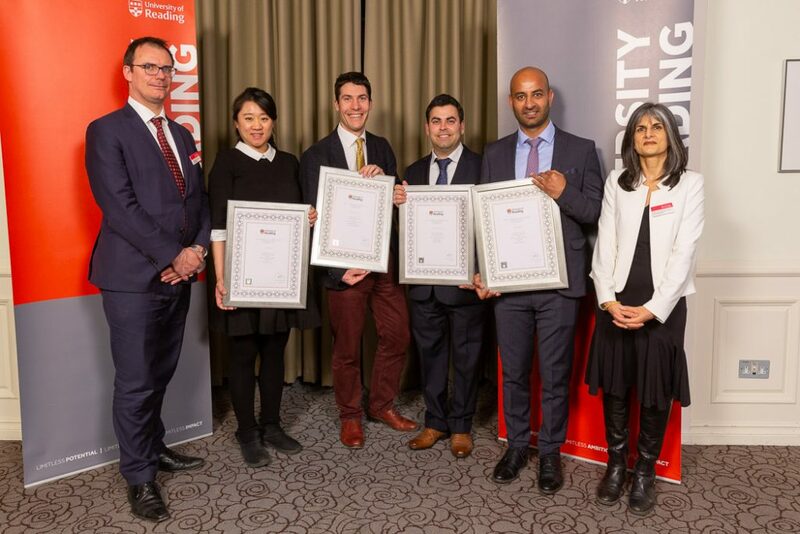 The five academics, one from each research theme, were honoured with a Research Output Prize for Early Career Researchers at University Court, the showcase annual event for the University community, on 18 March. 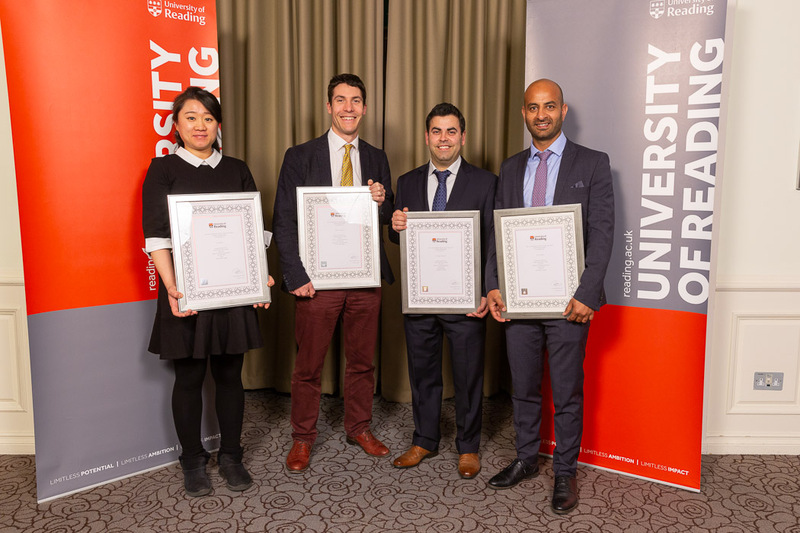 Professors Parveen Yaqoob and Dominik Zaum, Pro-Vice-Chancellors for Research and Innovation, said: “Congratulations to the five winners of this year’s Research Output Awards. These are five outstanding early career researchers and future research leaders, whose work not only addresses important challenges, but does so with great conceptual and methodological sophistication. Research Output prize winners Jing (Sarah) Guo, Edward Shepherd, Eugene Mohareb and Feroz Ahmad, flanked by Professor Dominik Zaum (left) and Professor Parveen Yaqoob (right), the University of Reading’s Pro Vice-Chancellors for Research and Innovation, at University Court on 18 March. Dairy products contain important nutrients such as calcium and vitamin B12, but they’re also high in saturated fats, so public health guidelines say we should limit our intake. Working with an international team, Jing carried out the biggest analysis ever of the effect of dietary dairy products, using data from study of nearly a million people. She discovered that diets high in dairy products were not linked to any increase in cardiovascular disease or death, suggesting that Public Health England guidelines on dairy intake should be reviewed. In his winning paper, Edward explores the relationship between national political ideologies and changes to English town and country planning policy and legislation. Using historical methods and interviews with civil servants, politicians and practitioners, the analysis suggests that this planning is intimately connected with political concepts such as liberty, property and the state, the natures of which are disputed from competing ideological perspectives. The paper traces how these ideological debates have both hampered and, paradoxically, stabilised English planning since the 1880s. Original paper: Edward Shepherd (2018) ‘Liberty, property and the state: The ideology of the institution of national English town and country planning’, Progress in Planning, published online: 6 Nov 2018 (DOI: 10.1016/j.progress.2018.09.001). We often think of the carbon footprint of the food we eat as an agricultural issue, not an urban problem. Eugene led research on how urban food consumption in the USA contributed to overall greenhouse gas emissions linked with the food system. He found that two-thirds of these emissions were found to be a direct result of urban activities rather than being down to rural agriculture. Switching from eating beef to chicken and reducing food waste were the two changes that would have the biggest impact on emissions, the research discovered. The findings could help researchers and policy-makers view the carbon footprint of urban food consumption in a new way. It is well known that the ‘bad’ type of cholesterol, called LDL, can clog up our arteries, leading to heart disease and stroke. Research carried out by Feroz has shed new light on how LDL is cleared from the body and suggests a potential new drug for treating cardiovascular diseases. In human cells in the lab, Feroz and colleagues showed that the drug was able to reduce the damage caused by cholesterol build-up. As this drug is already used to treat other diseases it could pass through clinical trials to benefit patients faster than a newly discovered drug. Hannah Newton, winner for the Heritage and Creativity theme. Hannah’s book, Misery to Mirth, aims to change our thinking about health in the past. Focusing on England in the late-sixteenth to early eighteenth-centuries, it challenges the entrenched assumption that disease in this era always led to death, and reveals instead that many people did, in fact, recover from illness. The book asks what doctors and laypeople meant by recovery, and explores the personal experiences of patients and their loved ones as they emerged from the sickchamber. Through these discussions, the book shines a light on the most profound, as well as the more everyday, aspects of early modern existence, from attitudes to life and death to details of what convalescents ate for supper. Monograph: Hannah Newton (2018) Misery to Mirth: Recovery from Illness in Early Modern England, Oxford: Oxford University Press. 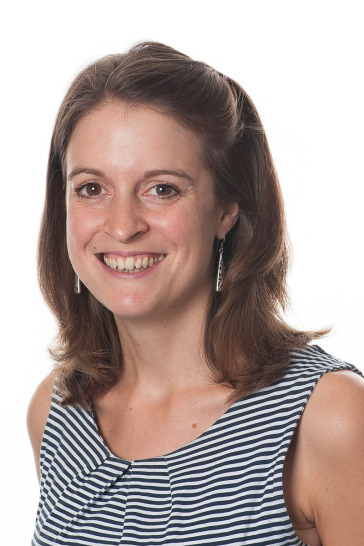 The University of Reading Research Output Prize is awarded to one academic from each research theme every year, and recognises and celebrates excellent research work by early career researchers. Researchers may submit their own work or might be nominated by others. Research Division Leaders define a selection process to decide which output from the Division to be put forward for consideration for the prize. Winners receive a prize of £1000. The deadline for next year’s submissions will be in January 2020. See the award guidelines for more information.